These little desserts are so much fun to eat. 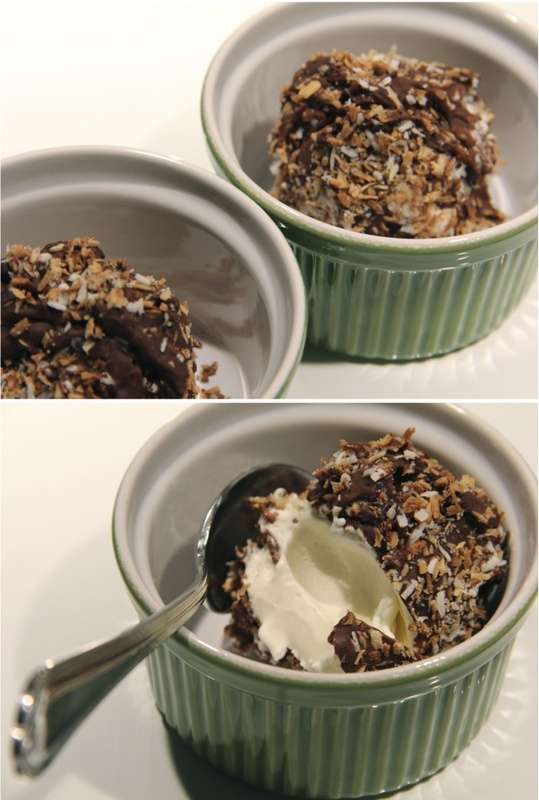 All you need is some regular old vanilla ice cream, chocolate chips for melting, and some toasted coconut. These chocolate & toasted coconut covered ice cream balls are quite easy to make. The quantities of ingredients will depend on how many you're making. First scoop out some vanilla ice cream into a ball shape. Drop them onto a flat dish or plate and place them in the freezer for at least 30 minutes. You want to get these balls as cold and as deeply frozen as possible! Next spread some shredded coconut on a baking sheet and bake at 375 degrees for a few minutes until golden brown (this doesn't take long). Transfer to a shallow bowl. Melt some chocolate chips in a double boiler, then let it cool just a bit... so that it stays melted but isn't super hot. 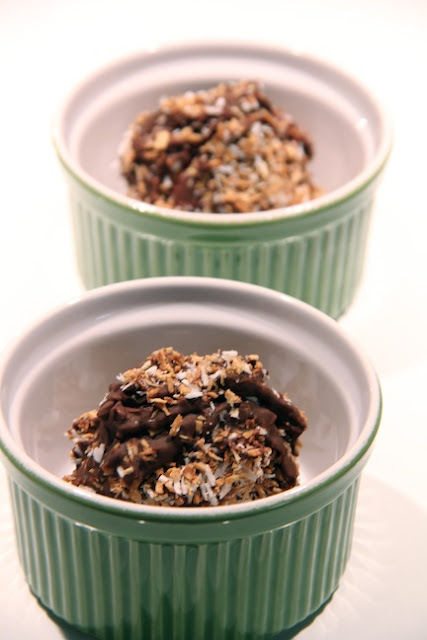 Now the tricky part (tricky because you have to move quickly).... one by one take an ice cream ball from the freezer, drop it into the melted chocolate, roll it around and then remove it with a spoon as fast as you can. Next roll it in the coconut and immediately put it back in the freezer. Don't worry if things get messy (they will). And don't worry if your balls don't turn out perfectly round, trust me, they'll still be delicious! They should be ready to go after about 15 minutes, but they can stay in the freezer several days, and possibly longer but I haven't tried that yet... they just don't last that long in my house! Oh! These would be perfect for a party. So cute and different.